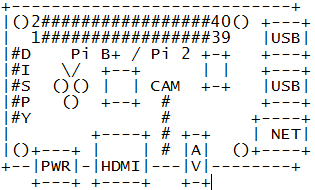 I really like the ASCII-Art from the Duckman, that he did for the Arduino. It really is great for documentation. So I tried to do the same for Raspberry Pi. I place them in the Creatice Commons [Creative Commons Attribution (BY) license]. Have fun using it, and I enjoy feedback.